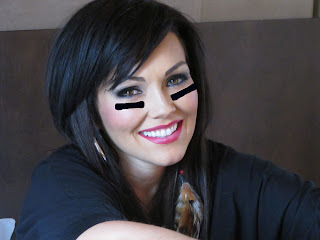 kandeej.com: How to do "Super Bowl" Make-Up! Maybe you're watching the Superbowl...maybe you have no idea who's even playing in the Superbowl! Maybe you are being forced by a male in your life to watch the Superbowl! and add some black grease (AKA Black Eyeliner! )...and draw rectangle under each on... on top of the cheekbone! Who was the first recorded person to wear the black grease paint under his eyes? BABE RUTH, in the 1930's, applied burned cork ashes, to help eliminate glare from the sun...football player, Andy Farkas caught onto the idea and took it to the football world. Studies have shown that the black grease paint actually does have an anti-glare effect, helping improve contrast sensitivity in the players sight! it's pretty much eyeliner...they just moved it down and inch and lay it on heavily! ha ha! awesome. love it Kandee. love you xoxo have a great weekend. haha maybe ill do that! but im gonna wear a gold eyeshadow and black eyeliner go steelers! you are pretty as always! I'm not being forced to watch but I do have to cook food. Lol! Your beautiful in your superbowl makeup! You are always but this is pretty. Cool! I knew that the Egyptian kings wore it to remove glare from the sun, but I didn't know that Babe Ruth wore it! Thanks Kandee! Awww man, Super cute idea, I wish I had thought of that earlier!! I will definitely save that for next season!